The term "word" can be defined as "an expression of meaning uttered or put forth by a sentient being", "a unit of language", or "a single meaningful element of speech or writing". We humans use words to express our thoughts, feelings, desires, plans, and will. What others know about us is, in part, based on the words they've heard from us. The Bible is often called the "Word of God" because it contains the thoughts, feelings, desires, plans, and will of God as He has revealed them to humankind. In the Gospel by his name, the Apostle John calls Jesus the "Word"  and appropriately so when you consider that God has revealed Himself to us through Jesus. Jesus didn't just give us God's messages in His teachings. Rather, He is God's message to us  God's Living Word to us. In defining who Jesus is as "the Word", it helps to understand John's intention when he called Jesus "the Word" and the etymology1 of the word itself as used in the Bible. As we have previously learned, the New Testament was written in Greek. The English term "word", as it applies to Jesus Christ, is translated from the Greek Logos meaning "the divine word of God". It was a common word in both Greek philosophy and the Jewish thought of that day, so both Jews and Gentiles would readily understand the point John was making when he introduced Jesus as the "Word". For his Jewish readers, John was pointing them back to the Old Testament where "Logos" is associated with God's revelation to mankind. The term "word", as it pertains to the carrying out of God's will ["His word", "word of the LORD", "word of God"], appears in the Old Testament more than 260 times: 73 times in the books of 1 Samuel to 2 Chronicles; 53 times in Jeremiah; 60 times in Ezekiel; and 32 times from Daniel to Malachi. Certainly, John's Jewish readers understood what he was referencing. In Greek philosophy, the term "logos" was used to describe material things that God used as an intercessory means by which He communicated with mankind. The Logos was thought of as a bridge between the transcendent God and the physical universe. Therefore, for John's Greek readers, his use of the term "Logos" would point to the idea of a mediating entity between God and the world. How appropriate and true when you think of Jesus as our Mediator and the One who bridges the gap between God and sinful man! Normally, an author states his purpose in writing at the beginning of the piece, and sometimes he writes a surprise ending that leaves us gasping in shock. The Apostle John, however, waits until the end of his Gospel record to state his purpose in writing it:"...these are written so that you may believe that Jesus is the Christ, the Son of God, and that by believing you may have life in his name." (John 20:31) And instead of a surprise ending, he writes a surprise beginning! Very clever. He begins his gospel with a sentence guaranteed to get his readers' attention. First, he uses a word and phrase that both Jewish and Greek readers would understand:"In the beginning was the word..." But then, he throws them a curve ball [sharply turns the dialog to something unexpected]. His Jewish readers well understood that God created the world by His word ["And God said..."], and they thought of Jesus as a human representative of God's revelation to man, so no surprise so far. And the Greeks readily understood about God using Jesus as a mediating entity by which they could know God. Both groups of people were correct in their understanding, as far as it went. Then, just as they're getting ready to nod in agreement with John, he presents Jesus  not just as a mediating principle or a physical representative of God, but as a fully divine living Person who somehow had also pre-existed with God. No doubt, many of John's Jewish and Gentile readers had to stop and take a breath at this point. They probably had so many questions, they didn't know which ones to ask first. Was this man, John, really saying what it looked like he was saying? Jesus of Nazareth . . . Jesus, the son of a carpenter . . . Jesus, "son of David" . . . Jesus, the healer . . . Jesus, the one who died on a Roman stake, but who some say was resurrected on the third day . . . Jesus, the itinerate preacher . . . Jesus, the man some people say was God's Messiah . . .
And now one of His disciples is saying that this same Jesus was and is the incarnate, divine, living Word of God! From this surprise introduction, John now goes on to explain to his readers about the living Word of God, Jesus Christ  fully God and yet fully man  who came to show us what God is like, to correct our misconceptions of what God is like, to be God with us, and to redeem us from the penalty of our sin. The Bible says that God is spirit. We can't see, hear, or feel Him with our natural senses. How then, can we know Him? How can weak, finite, sinful man understand the all-powerful, perfect, self-existent, invisible God? How can God show Himself to us? He wants to be more to us if we'll just let Him be. We asked the question earlier, "How can God show Himself to us?" The answer? Jesus. Jesus reveals God to us through His own human personality. What is God like? We can know by looking at Jesus, His Son. Jesus was and is the perfect manifest expression of God's love. Just as you or I might use a word or phrase to express our love for someone, God the Father uses the Word to express His love. But God is so powerful and all-encompassing, and His love is so extraordinary, that His Word had to become a whole being  a separate, yet united, living Entity. Since the Creation and the Fall, God has spoken to humankind in many ways, but the clearest revelation of His character, His personality, His heart, His ways, and His will is in His Son  God's living Word. And God continues to speak to us today as we read about Jesus. Jesus' life, emotions, attitude, mannerisms, work, and teachings all express God in terms of our own experiences, in a "heart language" we can understand. Jesus spoke of God's holiness, goodness, wisdom, justice, mercy, power, and love. But Jesus didn't just talk to people about God, He demonstrated God's character and God's heart. Men saw these qualities in Him. Unlike the Pharisees whose righteousness was a mere show for attention and prominence among the people, Jesus proclaimed and lived the highest moral standard the world has ever known. He was quite literally God's love in action as He ministered to human needs and gave His life to us and for us. On Calvary, we see the clearest expression of both God's perfect justice and His unfathomable love. God's righteousness demands the death penalty for our sin: "without the shedding of blood there is no forgiveness of sins." (Hebrews 9:22) And even though we deserve the death penalty because "all have sinned and fall short of the glory of God" (Romans 3:23), God's extravagant love for sinners compelled Him to suffer, not just death of the cruelest and most excruciatingly-painful sort, but such brutal torture beforehand that His face was disfigured beyond recognition (cf. Isaiah 50:6; 52:2-3)! And yet, as the Roman soldiers were driving the spikes through His wrists and feet, His unreasonable love even compelled Him to pray for forgiveness for them! What love! What a wonderful God we have! Jesus expressed God's feelings, thoughts, and plans in His teachings and in His person. Jesus was a great Teacher, but He acknowledged, "I do nothing on my own authority, but speak just as the Father taught me" (John 8:28) and "for all that I have heard from my Father I have made known to you." (John 15:15) Therefore, we know we can depend on Jesus' teachings in the Gospels as a true revelation of God and His truth. Through Jesus, we have come to know God as our all-wise, loving Father in Heaven who affectionately cares for His children. Clearly, He hates sin and hypocrisy, but through Jesus, we learned that He very much loves the sinner. And not only does He tell us how to be saved and how to live a contented and fulfilled life, but He models the same in absolute perfection. He longs for His wandering children to leave their sins and come home to Him. He lets us know about the wonderful life He has planned for us in His eternal kingdom. We have these truths in God's written Word and we see Jesus living them out before us. Jesus showed us not only what God wants, but that God has the resolve and power to carry out His purposes. Jesus' life of total obedience to His Father and intimacy with Him shows us the kind of life God wants each of us to have. Jesus' miracles were awesome demonstrations of God's power; they reveal to us His desire to help people, whatever our need is. Jesus said that He came to do His Father's will, and that He did the works of His Father. This proves that God wants to heal us, forgive us, and meet all of our needs today. We don't have to coerce or bargain with Him for provision, health, forgiveness, or other favors. He most gladly gives us His very best  in accordance with His perfect will and foreknowledge  every single day! Have you ever thought about the fact that the Living Word of God used the written Word of God as His weapon against evil? The Creator  the Elohim of the Universe, of all that exists  certainly has the power to destroy every evil being with just a word. But He chose a different way. He chose to become the Living Word and to demonstrate to us the authority we all have in overcoming evil with God's Word. In the book of Revelation, Jesus manifests [appears] as having a sharp two-edged sword protruding from His mouth. "...from his mouth came a sharp two-edged sword, and his face was like the sun shining in full strength." (Revelation 1:16) And to the church in Pergamum, Jesus said He is the one who has a sharp two-edged sword (cf. Revelation 2:12), indicating that God's Word is the strongest weapon for fighting against Satan and his evil plans. As the living Word, Jesus Christ represents the power of God. He is the Power of God! So when we preach Christ, we are preaching the power of God, against which no evil can stand. In the 19th chapter of Revelation, as we've already noted, we see Christ warring against, and gaining the victory over, the Antichrist. The key to Christ's power in that battle is found in verse 13: "He is clothed in a robe dipped in blood, and the name by which he is called is The Word of God." The Bible tells us that, for those of us who belong to Christ, He is the wisdom received from God. When the Apostle John said "the Word became flesh and dwelt among us" (cf. John 1:14), He was declaring that God's Truth had come down to us. Jesus, Himself, said that He is the truth. "Jesus said to him, 'I am the way, and the truth, and the life. No one comes to the Father except through me.'" (John 14:6) Notice, Jesus didn't say He was one truth or a truth among many, as skeptics today want to believe. No. He said He is the truth. What are some other statements Jesus made about Himself as being "true"? Jesus is the one and only standard of truth by which all else is counted true or false. Anything that does not line up with His Word is a lie from Satan, the father of lies (cf. John 8:44). Everything that agrees with God's Word is truth. Jesus' "weapon of choice" was God's Word. That should be our choice, too, when resisting and fighting "against the rulers, against the authorities, against the cosmic powers over this present darkness, against the spiritual forces of evil in the heavenly places" (Ephesians 6:12)! Not physical strength or will-power, not human wisdom, not profuse dialogue  but the Word. That is the only offensive weapon we have in our spiritual arsenal with which to defeat evil: "and take the helmet of salvation, and the sword of the Spirit, which is the word of God." (Ephesians 6:17) After all, spiritual warfare is simply replacing lies with truth. And even Satan, as powerful as he is, cannot fight against God's Word. 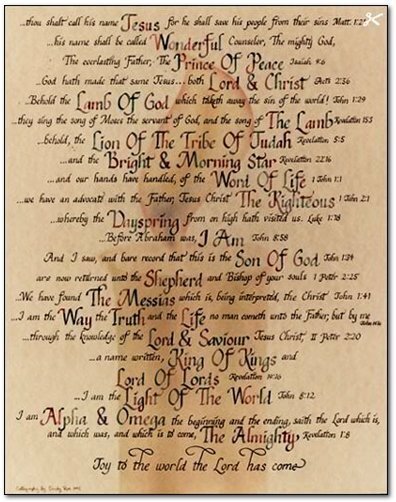 We find many names and titles for God in the Bible. Jesus, the Word, helps us to better understand them because He is the true expression of all that God is. When God called Moses to lead His people, Moses asked His name. God answered: "I Am that I Am." (Exodus 3:14) He told Moses to tell the people that I Am had sent him. This name tells us that God is eternal, changeless, always present. He is today, He is yesterday, and He is tomorrow. The Complete Jewish Bible renders that verse: "God said to Moshe, 'Ehyeh Asher Ehyeh [I am/will be what I am/will be],' and added, 'Here is what to say to the people of Isra'el: "Ehyeh [I Am or I Will Be] has sent me to you."'" In the name "I Am", God very plainly tells us that He is what He is and He does what He purposes to do. There is no deceit in Him. We can depend on Him. "I am ________________________________________." John 15:1. There have been many studies and books written about the true name(s) and attributes of God. We will not engage in a debate, nor will we attempt to convince anyone of which opinion or study is correct. Herein we simply present a few widely-known and generally-accepted concepts. The name of God that occurs most frequently in the Biblia Hebraica [Hebrew Bible] is the Tetragrammaton [from the Greek "word with four letters"], which is spelled in the Hebrew alphabet [Yod or Yud] [Heh] [Vav] [Heh] or, reading right-to-left, [Yod-Heh-Vav-Heh]. Most of our English Bibles use the all-uppercase word LORD in place of the Hebrew name . And the name is generally transliterated as "YHWH", "YHVH", or "YHUH". Regardless of which transliteration one uses, the Hebrew Tetragrammaton is the distinctive personal name that the God revealed to the nation of Israel ±5000 years ago, which we have Anglicized to "Jehovah" or "Yahweh". Most translators and Hebrew scholars agree that the Tetragrammaton is a form of the Hebrew root "havah" which means "to be" or "to exist". Thus, Yahweh/Jehovah becomes the Eternal or Self-Existent One who brings into being. Jesus  the Word who reveals God to us  is a physical manifestation of the truth of the following names or attributes of God. Jesus, the Great Physician, heals the body, mind, heart, and broken spirit. Jesus gives us inner peace that doesn't depend on our circumstances, but on who He is. In Christ, we have peace with God, peace with ourselves, and peace with others. Jesus, the Good Shepherd, laid down His life for us, and He now lives to take care of all who follow Him. There is only one way to have a clean heart and life. We can have the right kind of life and right relationship with God only by union with Jesus. Jesus alone is our Righteousness. Jesus has promised to be with us always. He is always near to help us. Jesus is the Banner under which we engage in spiritual battle and defeat Satan, the enemy of our souls. This title means that Jesus is our Leader, our Victory, and Strength. With Him we can be strong and victorious in the daily battles of life.